Malaysia happens to be my new favorite destination in Asia. If you'd like to learn why, check out my Top 10 Reasons to Visit Malaysia article! Malaysia’s primary ethnic groups are Malay, Indian, and Chinese so “Malaysian food” consists of food from all these cultures, and has also been influenced by the Dutch, Portuguese, and British, who have all taken turns occupying the country. Malaysia continues to receive immigrants and tourists from all over the world and clever entrepreneurs are meeting the demand for food from home. 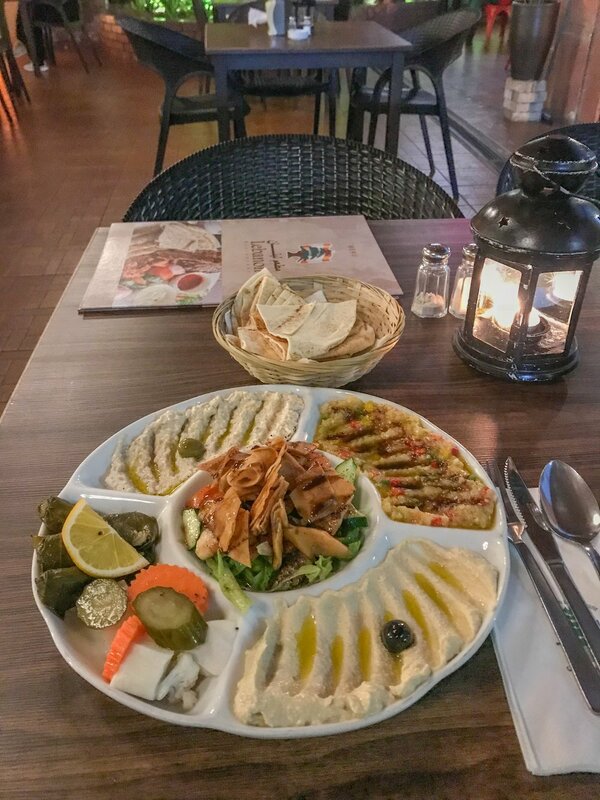 In Batu Ferringhi, along the northern coast of Penang, many Arabs, particularly from Saudi Arabi, vacation and honeymoon along the beaches and as a result, the city has become a hub for fantastic Arabic food. Because of Malaysia's distinct mix of cultures, eaters will find uncommon fusions, such as fish served in many Indian vegetable dishes, particularly in the south. Vegetarians and vegan travelers beware, as tiny anchovies are popular and hard to spot in some dishes. Nyonya cuisine is the result of the unique blend of Chinese ingredients with distinct Malay/Indonesian spices and cooking techniques that originated in the region and can be found across the country. 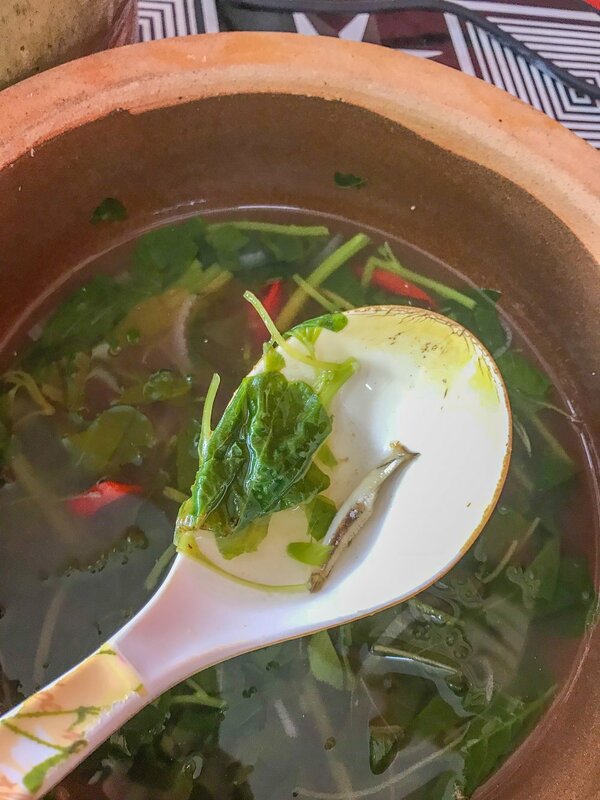 Coconut milk, lemongrass, tamarind juice, kaffir lime leaves, galangal (similar to ginger), laksa leaves (spicy Vietnamese corainder), and green pandan leaves are key ingredients, along with condiments like lime juice, fresh chilies, shallots, and cincaluk, a sour and salty shrimp paste. 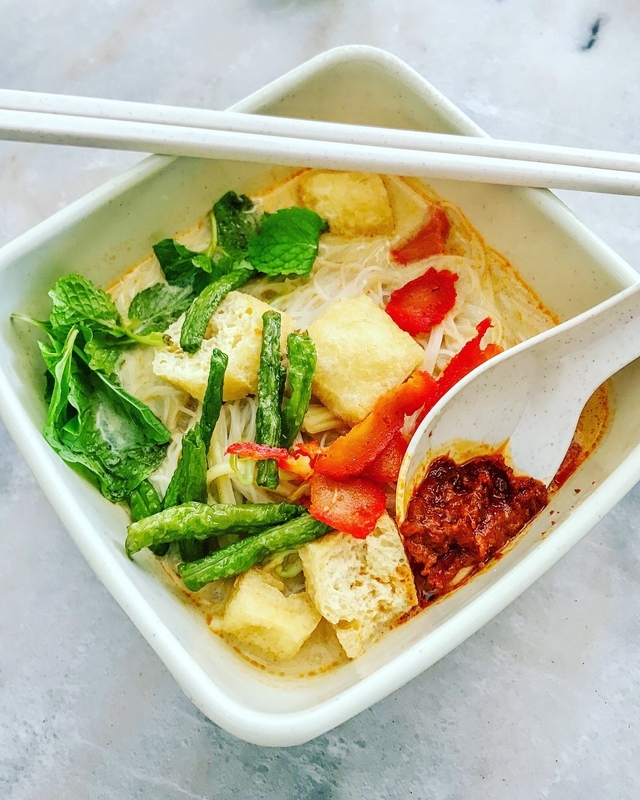 One of the most popular and must-try Nyonya dishes is laksa, a spicy noodle soup served two ways - sour (asam laksa) from Penang, or coconut milk-based (laksa lemak), from southern Malaysia. Don't leave Malaysia without eating at a couple hawker stalls! These open-air food complexes house many food stalls that prepare tasty, cheap foods on site. Indian, Malay, Chinese, and fusion foods abound, and there's often at least one "American food" food stall, which tends to be limited to fried chicken and French fries. Pro tip: see what the locals are ordering and just order that! Most stalls have helpful full-color displays so you can just point at what you want if language is an issue. Vegetarian and vegan travelers may recognize tempeh, a nutritious protein originating in Indonesia and popular in Malaysia. While tempeh is limited to vegetarian restaurants in the United States, it's enjoyed by meat eaters across Asia. The fermented, slightly nutty, soy product is often found in curries, soups, and fried noodle and rice dishes and is especially tasty when fried. 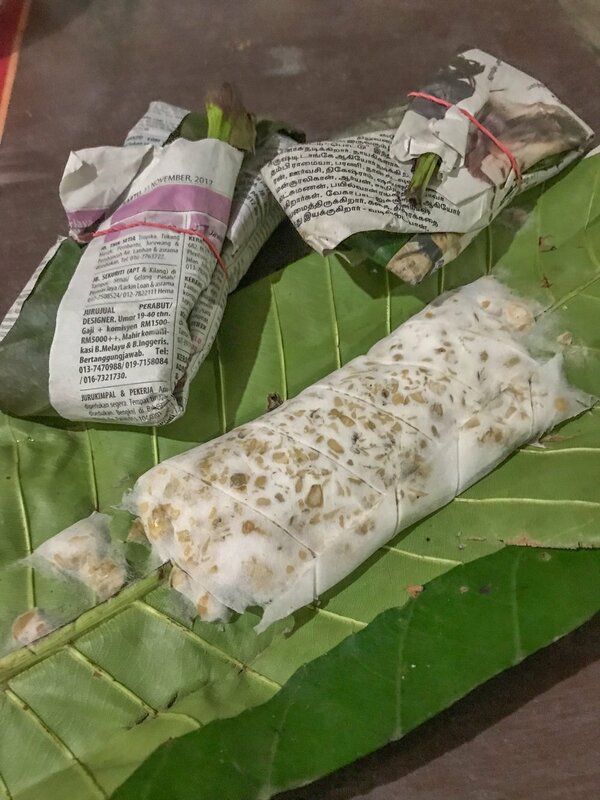 It can also be found in markets, wrapped in banana leaves and newspaper! Until visiting Malaysia, I assumed Penang was a city in Thailand, since "Penang curry" is one of the most popular dishes served in Thai restaurants, across the United States. Penang, in fact, is a province in Malaysia and is the country’s culinary capital. Malaysia's famous nasi goreng (fried rice) and mie goreng (spicy noodles) are served up at street carts and fine restaurants across the city, alongside countless varieties of rich and flavorful soups. Malaysia's signature dessert is cendol, an iced sweet treat that contains droplets of worm-like green rice flour jelly (made green with pandan leaves), coconut milk, and palm sugar syrup. It is often topped with jackfruit or sweet red beans and can be found at street carts and restaurants across the entire country. learn the 10 ten reasons to visit Malaysia! Fried rice, meat skewers, seafood, curry soups, spicy noodles are popular dishes in restaurants and street carts alike. If you want more veggies, head indoors to an Indian or Chinese restaurant. Many Indian restaurants offer buffets, which let you mix and match and proteins, starch, and veggies. These buffets are especially good for vegetarian and vegan travelers - or anyone who wants to try everything on the menu! For fun, order a thali platter (many small metal bowls filled with different dishes) served on a banana leaf! Some Indian restaurants in Penang even serve mock meats! I found anchovies in the okra in Johor Bahru! Take a stroll through the market to find interesting, colorful fruits like dragon fruit, jack fruit, mangosteen, lychee, and snake fruit! You're also likely to find freshly roasted chestnuts or steamed peanuts, sometimes flavored with turmeric! I didn't usually have a kitchen in the hotels and guest houses where I stayed in Malaysia so I always brought my metal lunchbox (an Indian "tiffin") with me to fill up with leftovers to eat at home later. The spicy noodles made a GREAT breakfast, which I enjoyed in my pajamas from the comfort of my bed. I bring this metal lunchbox with me on every single trip and even take it to restaurants at home in New York City to cut down on plastic and styrofoam take-out container waste!